Guide to camping in Denmark- what should I remember as a camper? It is recommended when renting a caravan through Camptravel that you inquire about the camp rules, conditions, downloading rental contract and read it carefully. 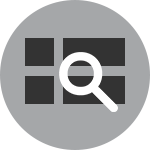 Get as many questions resolved before you retrieve your vehicle. 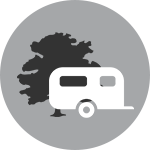 If you rent a caravan that you want to run around with the driver of the car pay extra attention to rules for driving with caravan and the demands when towing a trailer/caravan and requirements of the car. Get packed sensible and remember that you must not carry excessive weight. If this is your first time and are a little nervous to drive with a caravan, there are many courses around the country, including at FDM, that can be learned in a short time. Ensure amusement for the kids and take frequent breaks - it's vacation! You need a valid Camping Key Europe (camping pass) to stay overnight at Danish campsites It can be bought at any Campsite around Denmark. A valid Camping Key Europe is valid in all European countries. You just fill out an order form on arrival at the reception of the campsite you have booked space. The order form serves as a temporary camping card until you receive the new camping. Camping Pass will be provided with a year mark, which is valid for one year. Remember to include the temporary camping cards (order form) when you travel on. The camping pass costs 110 kr ~ 14.7€ (2015). All valid Camping Keys are covered by indemnity against a third person if the card holder does not have other insurance coverage. The insurance only covers damage, according to Danish law can be held responsible for. 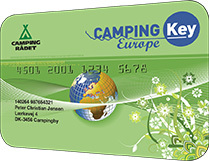 You can also buy a Camping Key Europe on the internet If you did not get the opportunity if buying your Camping Key at one of DK-CAMP's 300 campsites, you can buy it on the internet. Anyone can obtain an individual Camping Key, but children under 15 must have parental consent. A camping card covers couples and singles, and their children under 18 years. Everyone should have the same residence. Have you turned 18, you must have your own Camping Key. Children under 18 can not travel alone using their parents' Camping Key. In this case, each child should have issued his own personal Camping Key. Traveling parents with children's friends should have an individual Camping Key each, as they do not have the residence as the parents. It costs 10 kr ~ 1.30€ handling fee to buy a Camping Key Europe on the internet. Group Keys will cost 110kr ~ 14.7€. Camping Keys can be issued to institutions, schools, kindergartens, schools, sports clubs etc. There must be at least 5 and a maximum of 11 participants travelling together. Group leaders shall be 18 years. Passports must, in order to be valid, be accompanied by a list of names of all participants. Transit Brand + transit card costs 35 kr ~ 4.7€. If you only plan on spending one night at a campsite, you can purchase a transit. One transit brand is valid for one night. The purchase of the fourth transit mark of the same year, can be exchanged transit form for a camping. Note that it is more expensive to buy a camping this way. Transit is only valid in Denmark. Note: The Campsite's rule of order must be held for everybody. When you arrive at our holiday destination parks in outside the boom to the campsite and go into the reception/information to check in. Check in means that you are assigned a place unless you have already booked one. It is advisable to book in advance, that's for sure! Generally, you pay an individual fee for each family member, power, and space per day. You can check the price of the stay by asking the site or look at the their website. In some places you have to pay for water activities, Wi-Fi, while other places have it included. Camptravel corresponds to having rented a car and driving to a hotel, where you have to pay for an overnight stay. So remember - the rental price for your caravan is equivalent to renting a car. When you have checked in and been assigned to your place, you drive in and attach the power and maybe water to the cart, unless it has already been hired as a permanently established vehicle in advance. On departure day you will check out and pay for the stay in the reception/information. Before the departure, be sure to read for the power unless you pay a fixed daily rate - depends on the campsite. 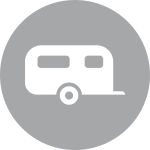 After a trip with hopefully lots of exciting experiences, your caravan must be returned to the owner. Start well in advance so you manage to getting it properly cleaned after your stay and check the inventory as it was made available to you. Remember that your appearance as guest is important to get good publicity and could save you any additional costs. Be honest about things that are broken or damaged in the caravan that were caused during the holiday. If you have any suggestions about improvements to the owner, they will surely be grateful for your feedback as a user/tenant.